Cross Connect: one of First Greater Manchester’s early attempts at trying to break into the lucrative South Manchester corridor. Five years after purchasing the bus operations of Finglands Coachways, First Greater Manchester is set to rationalise its operations in South Manchester. As well as pulling out of the 42 route to East Didsbury, their Rusholme depot will be closed. Therefore, First Greater Manchester’s remaining services along the Wilmslow Road corridor will run from Queens Road Depot in Cheetham. After withdrawing their journeys on the 42 route from Piccadilly Gardens to East Didsbury, Stagecoach Manchester will be the sole operator. Between Piccadilly Gardens and Sale, there will be no changes made to the 41 route via West Didsbury and Northenden. Also affected by the depot move is the 53 route. Which, by some happy coincidence, will be returning to its spiritual home off Cheetham Hill Road. Employees at the Rusholme depot will be transferred to Queens Road. Since Finglands Coachways’ arrival, the Rusholme garage has seen continuous use since 1907. Following First Greater Manchester’s purchase of Finglands’ bus operations in January 2014, the company leased the depot though didn’t own any buses. Its 100 bus operation staff became First Greater Manchester employees. Shortly after their arrival, they tried to make inroads into the lucrative South Manchester bus market. 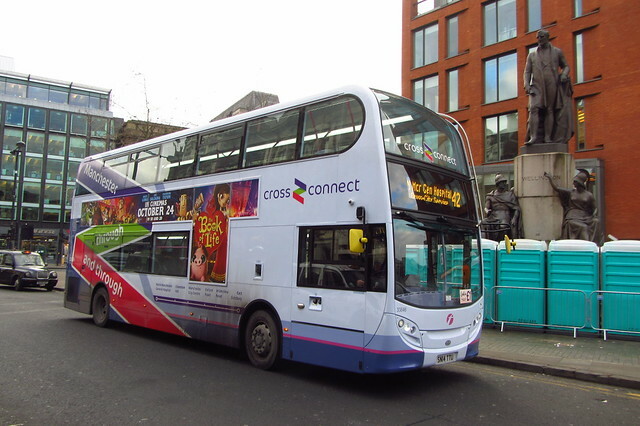 A value-led one which saw First Greater Manchester introduce special student fares. Fares at levels cheaper than adult fares on First’s other 41 route in Tameside (a MCT Travel route since 2015). Another innovation, killed off by Manchester’s chronic congestion was Cross Connect. Its premise was to revive cross-city links – by extending South Manchester’s 41 service to Eccles. The 42 was extended to North Manchester General Hospital. Wright StreetLite Max buses were added to the fleet, followed by brand-new Enviro400 double deckers. With First Greater Manchester concentrating more of its resources on the Wilmslow Road corridor, it was felt that they kept their eye off the ball in its core area. Since then, its Wigan operations had been sold to Stagecoach Manchester (as Stagecoach Wigan). Last year, FirstGroup closed its depots in Dukinfield and Bury – much to the ire of regular passengers. It is claimed that FirstGroup’s losses in Greater Manchester prompted the move. First Greater Manchester aims to complete the transfer before January 2019. The decision, in their words, “is part of steps we are taking to make the bus network in Manchester sustainable, and put the business on a more stable footing”. Before First Manchester tries to make inroads into South Manchester, it might be an idea if they were to sort their act out in the North first. A number of their services around the Ashton area are shambolic at best, non-existent at worst and I’ve heard similar tales told of their services across other parts of GM. Queens road depot should bring back the best bus route they had which was the 167 Manchester city centre to the bridge inn pub in Norden.Oldham depot should put the saddleworth bus routes together on one rota.